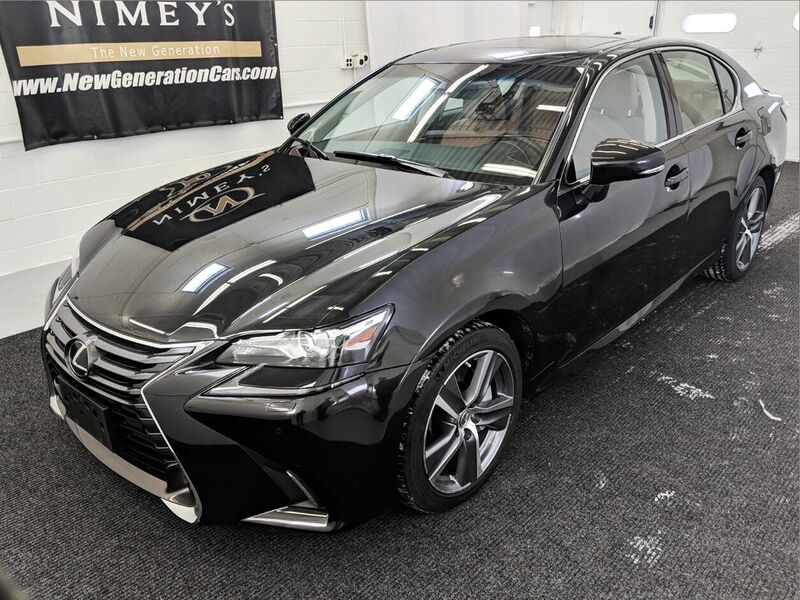 Our 2017 Lexus GS 350 AWD Sedan is amazing as it takes center stage in Obsidian! Powered by a proven 3.5 Liter V6 that offers 311hp for swift passing while connected to a smooth-shifting 6 Speed Automatic transmission. You'll be enthused with this All Wheel Drive Sedan's brilliant handling and appreciate near 28mpg on the highway. Make a powerful first impression in your GS 350 with its athletic stance that is perfectly complemented by unique alloy wheels and LED headlights. Rendered with sophistication and attention to detail, the GS posh cabin features a beautiful sunroof, keyless entry/ignition, heated leather front seats, driver seat memory functions, a rearview camera, rich wood trim, and ambient lighting. Enjoy next-level connectivity with the Lexus Remote Touch interface, a prominent display, Bluetooth phone/audio, full-color navigation, Siri integration, and a surround-sound audio system with CD, available satellite/HD radio, USB interface and auxiliary audio jack. You're driving in style now! With Lexus, peace of mind comes standard behind the wheel of our GS. Enjoy anti-lock brakes, stability and traction control, front knee airbags, full-length side curtain airbags, front and rear side airbags, blind-spot monitoring, rear cross-traffic alert, front-seat active head restraints, and emergency telematics. With its excellent safety ratings, refined style, excellent efficiency and over-all competence, our GS 350 AWD is an ideal traveling companion. Print this page and call us Now... We Know You Will Enjoy Your Test Drive Towards Ownership! Step up to an ultra-comfortable ride and superior performance with our 2017 Chrysler 300S AWD Sedan that's bold and eye-catching in Gloss Black! This sedan makes each commute a pleasure with its 3.6 Liter V6 that generates 300hp paired to an 8 Speed Automatic transmission with paddle shifters and Sport mode. This All Wheel Drive Sedan offers you a powerful ride that's easy and responsive as you attain near 27mpg along the way! The imposing, sporty styling of our 300S is more than adept at turning heads everywhere it goes. It's undeniably beautiful with a distinct grille and gorgeous alloy wheels. Open the door to our 300S and feel empowered surrounded by upscale finishes and diligent attention to detail. As you relax in your heated leather power-adjustable sport seat, take note of remote start, keyless entry/ignition, dual-zone automatic climate control, sunroof, and a rearview camera. The easy-to-use Uconnect system features a prominent touchscreen, Beats Audio, Apple CarPlay/Android Auto compatibility, available satellite radio, USB ports, Bluetooth, voice command, and an auxiliary input jack. Chrysler takes your safety and security seriously and has carefully outfitted this 300 with advanced airbags, hill-start assist, rain-brake assist, and other features to ensure your peace of mind. Stylish, sporty, efficient and secure, this is a compelling blend of everything drivers just like you desire. Print this page and call us Now... We Know You Will Enjoy Your Test Drive Towards Ownership! Check out our 2018 Chrysler 300 Limited AWD Sedan that takes center stage in Billet Silver! Powered by a 3.6 Liter V6 that delivers 292hp while connected to a responsive 8 Speed Automatic transmission with Rotary E-Shift. Enjoy this smooth, quiet ride that's easy and responsive as you attain near 31mpg along the way inside this All Wheel Drive machine! It's undeniably appealing with a distinct grille and gorgeous alloy wheels. The dignified styling of our 300 Limited is more than adept at turning heads everywhere it goes. Open the door to our Limited and feel empowered surrounded by upscale finishes and diligent attention to detail. As you relax in your heated and cooled leather power-adjustable seat with memory, take note of keyless entry/ignition, heated rear seats, and dual-zone automatic climate control. The easy-to-use Uconnect system features a prominent touchscreen, Apple CarPlay/Android Auto compatibility, available satellite radio, USB ports, Bluetooth, voice command, and an auxiliary input jack. Chrysler takes your safety and security seriously and has carefully outfitted this 300 Limited with advanced airbags, hill-start assist, rain-brake assist, and other features to ensure your peace of mind. Stylish, refined, efficient and secure, this is a compelling blend of everything drivers just like you desire. Print this page and call us Now... We Know You Will Enjoy Your Test Drive Towards Ownership! Reward yourself with the invigorating 2013 Lexus GS 350 AWD shown off in Starfire Pearl. Powered by a proven 3.5 Liter V6 that supplies 306hp while connected to a 6 Speed Automatic transmission for easy passing. This All Wheel Drive team rewards you with a respectable 26mpg on the open road as well as sure-footed stability. Revised suspension, a stiffer body structure, and a quicker steering system put the handling of this car at the head of the class. One look at our bold 350 and you'll be captivated by the sweeping contours accented by 17-inch alloy wheels, sunroof, automatic xenon headlights, and fog lights. The GS 350 cabin exudes a welcoming feeling by enveloping you in comfortable leather heated front seats. A central control screen with navigation is refreshingly easy to use as you stay connected with Bluetooth or listen to a 12 speaker premium audio system while you coast down the road in this exquisite car. Lexus safeguards you with anti-lock brakes, traction and stability control, numerous airbags, active front head restraints and a rearview camera. Safety Connect, a telematics service with automatic collision notification, a stolen vehicle locator, and emergency assistance button, is also standard. Don't deprive yourself of this experience. You've got to get behind the wheel. Print this page and call us Now... We Know You Will Enjoy Your Test Drive Towards Ownership! Experience our 2015 Toyota Prius Persona Series Hatchback presented in Blizzard Pearl. The seamless integration of our 1.8 Liter 4 Cylinder and an electric motor offers 134hp blended with a seamless CVT that allows for impressive acceleration; reaching 60mph in just over 9 seconds. This Front Wheel drive rewards you with 51mpg in the city as well as low emissions and a quiet driving experience with three driving modes so you can have your Prius your way! The aerodynamic profile of our Prius Persona Series is accented by 17 inch dark metal 5 spoke alloy wheels and projector beam headlights. Inside the Prius Persona, getting comfortable is easy thanks to 8-way power adjustable seats with SofTex premium seating featuring gray stitching. Enjoy impressive cargo capacity, an auto-dimming rear view mirror with HomeLink, and multiple displays that help you to monitor your car's remarkable efficiency. You'll appreciate Display Audio and Entune Apps which includes a prominent touchscreen, JBL speakers, CD player, available satellite radio, auxiliary audio jack, USB port, vehicle information and hands-free phone capability with advanced voice recognition and music streaming via Bluetooth. A Top Safety Pick, our Toyota Prius includes a rearview camera and the Star Safety System, which is a combination of advanced safety features to keep you and your precious passengers out of harm's way. A perfect blend of efficiency, versatility, comfort and safety, Prius is an outstanding choice for your demanding lifestyle! Print this page and call us Now... We Know You Will Enjoy Your Test Drive Towards Ownership! Stepping out in style in Black Sand Pearl, our 2016 Toyota Corolla S Plus Sedan adds more driving pleasure to your day! At the heart of our sedan is a 1.8 Liter 4 Cylinder that offers 132hp on demand, while paired with a fun-to-drive Automatic transmission. This ideal Front Wheel Drive combination helps you achieve near 38mpg on the open road and is perfect for your commute. It's no surprise that our Corolla ranks as the best-selling car of all time! Check out the modern stance, rear spoiler, sunroof, 17 inch alloys wheels, and fog-lights that strike the perfect balance of style and efficiency. With stability control, anti-lock brakes and airbags, you can rest assured that you and your passengers will be kept safely out of harm's way. Driving this car may be the best decision you've made all year! Print this page and call us Now... We Know You Will Enjoy Your Test Drive Towards Ownership! Stylish and proven our 2015 Toyota Camry LE Sedan in Super White awaits you! Powered by a proven 2.5 Liter 4 Cylinder that offers 178hp while paired with a smooth-shifting 6 Speed Automatic transmission helping you with easy passing. This Front Wheel Drive rewards you with nearly 35mpg on the open road. Solid engineering and high-grade artistry continue to earn this car accolades every year! The exterior of the LE is accented by a dynamic shape, automatic headlamps, and distinctive tail lights. The ergonomically designed LE interior features a considerable touch-screen Entune Audio display with Bluetooth phone and a six-speaker sound system with steering wheel mounted controls. You'll also appreciate remote keyless entry, cruise control, a tilt-and-telescoping steering wheel and split-folding rear seats. Confident handling, straightforward technology and lots of comfortable passenger space make this car an absolute delight to own. Toyota Anti-lock brakes with brake assist, stability control, and an army of airbags combine to safeguard you in this impeccable Camry with a sterling reputation for reliability. Enjoy this smooth, quiet ride! Print this page and call us Now... We Know You Will Enjoy Your Test Drive Towards Ownership!